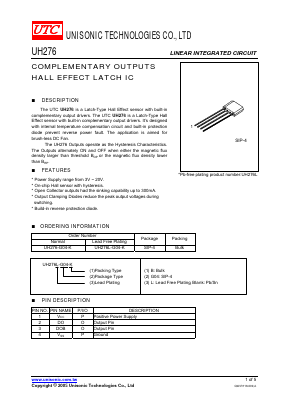 The UTC UH276 is a Latch-Type Hall Effect sensor with built-in complementary output drivers. The UTC UH276 is a Latch-Type Hall Effect sensor with built-in complementary output drivers. It’s designed with internal temperature compensation circuit and built-in protection diode prevent reverse power fault. The application is aimed for brush-less DC Fan. The UH276 Outputs operate as the Hysteresis Characteristics. The Outputs alternately ON and OFF when either the magnetic flux density larger than threshold BOP or the magnetic flux density lower than BRP. * Power Supply range from 3V ~ 20V. * On-chip Hall sensor with hysteresis. * Open Collector outputs had the sinking capability up to 300mA. * Output Clamping Diodes reduce the peak output voltages during switching. * Build-in reverse protection diode.